It is time to save money thanks to a special offer from U.S. Banana Republic. Take 30% off your purchase of $70 or more. Or, take 40% off your purchase of $200 or more. To receive the offer use the promotion code BRMORE at checkout. Source of the information is Banana Republic. Offer is valid until May 22, 2017. 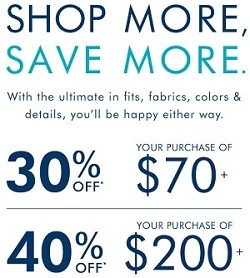 More details available at Banana Republic online.